Pentek CBR2-10 Water Filter Cartridge is a 10"x2.5" Carbon Briquette 0.5 micron Multimedia Water Filter cartridge # 155268-43. CBR2-10 Water Filter is a premium, high capacity Chlorine, Taste and Odor reduction cartridge that also reduces lead, VOCs (Volatile Organic Compounds) and MTBes. 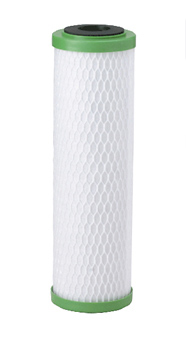 The Pentek CBR2-10 Water Filter Cartridge removes chlorine. Reduces lead through 2000 gallons. Reduces VOCs and MTBEs. Chlorine, Taste and Odor reduction past 20,000 gallons. The Pentek CBR2 offers 99.95% reduction of Cryptosporidium, Giardia, Entamoeba and Toxoplasmacysts. Pentek CBR2-10 filters and CBR2 series cartridges are manufactured using a patented process that combines powdered activated carbon ( PAC ) with a specially designed absorbent media for lead and mercury reduction. The cartridge is protected by Endurawrap™, a unique polyolefin bilaminate prefilter, designed to significantly increase useful life of the cartridge by trapping sediment that typically clogs carbon cartridges. This filter has a hole all the way through, because it is made out of solid carbon block. If your filter looks exactly like it but a hole is not all the way through, it is most likely a GE FXUVC Carbon Filter. Q: What's the difference between Pentek CBR2-10 and CBR2-10R? A similar Cartridge, Pentek CBR2-10R has a built-in flow restrictor to limit water flow down to 0.6 gallons per minute (gpm). This is done to increase contact time with the media, which may be good for under sink systems. Pentek CBR2-10 does NOT have a flow restrictor. Q: Why does the CBR2 cartridge say "Not for sale in the State of California"? CBR2 series cartridge says "not for sale in the State of California" because manufacturer, Pentair, chose not to pursue California certification at this time. State of California has its own certification process for water filtration products. The cost of certification is very high, and Pentair chose not to undergo it at the time in order to keep the cost of filters down. *NOTE: Based on manufacturer’s internal testing. ** NOTE: Giardia, Cryptosporidium, Entamoeba and Toxoplasma cyst claim based on tests showing greater than 99.95% reduction using NSF Standard 53 protocol. NOT FOR RESIDENTIAL SALE IN CALIFORNIA.